Neither nuclease nor immunostimulation nor endosomal barrier stays these nanocarriers from the swift completion of their appointed rounds. Reassuring words. But if you’re sending an RNA-based drug, you’d still like some sort of delivery confirmation. To date, nanoparticle delivery services have offered DNA barcodes, which are sort of like tracking numbers, except that looking them up has required genetic sequencing. Not terribly convenient, and not so informative—not at the cellular level. Fortunately, an alternative tracking technique has been devised by scientists based at Georgia Tech. The scientists, led by biomedical engineer James E. Dahlman, have developed a new screening process that could dramatically accelerate the identification of nanoparticles suitable for delivering therapeutic RNA into living cells. The technique would allow researchers to screen hundreds of nanoparticles at a time, identifying the organs in which they accumulate—and verifying that they can successfully deliver an RNA cargo into living cells. The technique was described October 1 in the Proceedings of the National Academy of Sciences, in an article titled, “High-throughput in vivo screen of functional mRNA delivery identifies nanoparticles for endothelial cell gene editing.” According to this article, the technique developed by Dahlman and colleagues incorporates DNA barcoding but provides better resolution and greater convenience. The system is called FIND, for Fast Indication of Nanoparticle Discovery. Besides ensuring that each nanoparticle carries a DNA barcode, the FIND system packs the nanoparticles with a snippet of mRNA that is turned into a protein known as Cre. The Cre protein generates a red glow, identifying cells that the nanoparticles have entered and successfully delivered the mRNA drug, allowing the researchers to identify which nanoparticles can deliver RNA drugs to the cells of the specific organs. Therapies based on RNA and DNA could address a broad range of genetically based diseases, including atherosclerosis, where such therapies may be able to reverse the buildup of plaque in arteries. Nanoparticles used to deliver RNA and DNA into cells are made from several ingredients whose levels can be varied, creating the potential for tens of thousands of different nanoparticles. Finding the right combination of these ingredients to target specific cells has required extensive trial-and-error discovery processes that have limited the use of RNA and DNA therapies. Use of the DNA barcoding process allows hundreds of possible nanoparticle combinations to be tested simultaneously in a single animal, but until now, researchers could only tell that the combination had reached specific organs. 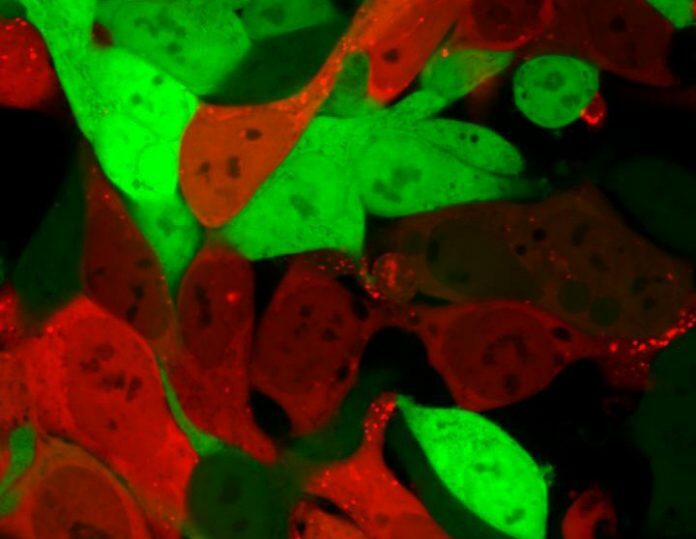 By examining which cells within the organs have the red glow, they can now verify that the nanoparticles carried the barcodes and delivered functional mRNA drugs into the cells. The researchers believe their technique can deliver therapeutic RNA and DNA to a wide variety of endothelial cell types, and perhaps also to immune system and other cell types. In future work, technical challenges include demonstrating that identifying an affinity for mouse organs predicts which particles will work in the human body, and that the approach works for different classes of genetic therapies.